Two US contemporary TV comedies, Master of None (2016-) and Atlanta (2016-), illustrate how the entire genre is crossed by deep transformations and slight changes. Distribution methods and consumption practices influence and reshape textual models, production routines, and established genre definitions. And even the basic forms of audience engagement in comedy need to be at least partially reinvented in this new scenario. Master of None (2016–) is a Netflix comedy series created and developed by Alan Yang and Aziz Ansari. Ansari – a comedian already known as a stand-up and for his much-loved role as Tom Haverford in network sitcom Parks and Recreation (NBC, 2009–15) – also plays the main character, an Indian-American thirty-something struggling actor named Dev Shah. The two ten-episode seasons follow his struggle to find love and his everyday encounters with friends and family. The story advances in single steps, each comprising a stand-alone episode, rather than through a traditionally conceived horizontal storyline, in a set of distinct “enlightenings”. Each step, moreover, adopts at least partially different viewpoints and narrative modes, exploring various creative and writing possibilities, among which “classic” comedy has only a minor role. This approach is clear from the opening of each episode, with the “Master of None” brand acting as a collection of distinct features, as with TV movies or independent films: after the series title, the word “presents” appears, followed by a different title in big letters, with various shapes, colors and styles; the actual narrative then begins, often by diving into the middle of the action. Episodes focus on single topics and narrative devices, such as the bond between second-generation immigrants and their parents (1×02, “Parents”), the representation of ethnic minorities on television (1×05, “Indians on TV”), a fast-forward take on a romantic relationship through a series of awakenings (1×09, “Mornings”), the role of older generations in contemporary society (1×08, “Old People”), a Neorealist-style homage to Italian film Bicycle Thieves (Vittorio De Sica, 1948) (2×01, “The Thief”), the slow coming out of the protagonist’s best friend over several Thanksgiving parties (2×08, “Thanksgiving”), the stories and characters of an assortment of New Yorkers (2×06, “New York, I Love You”), or how apps like Tinder affect the dating experience (2×04, “First Dates”) (fig. 1-2). Fig. 1: The title screen of Master of None 1×04. Fig. 2: The title screen for Master of None 1×07. Another recent comedy series, aired on basic cable channel FX, contains many similar elements. Atlanta (2016–) was created, written and performed by Donald Glover – an actor, comedian and rapper known mostly for playing Troy Barnes in NBC’s Community (2009–15). His character, Earn Marks, a college dropout with a daughter and ex-girlfriend, is trying to earn a living helping his cousin forge a career as rapper “Paper Boi”. Its ten-episode season focuses on the main character and his friend’s struggles in the tough Atlanta suburbs, dealing with poverty, race, violence, social conflicts, the media industries, and twisted white imageries. After introducing the main clutch of characters over the first few episodes, the series changes theme and location at every installment. It explores a charity basketball game, including a surreal African-American Justin Bieber (1×05, “Nobody Beats the Biebs”), labyrinthine evenings at a local nightclub (1×08, “The Club”) and an elegant reception (1×09, “Juneteenth”), and takes the perspective of the female lead, Earn’s ex-girlfriend Van (Zazie Beetz) (1×06, “Value”). 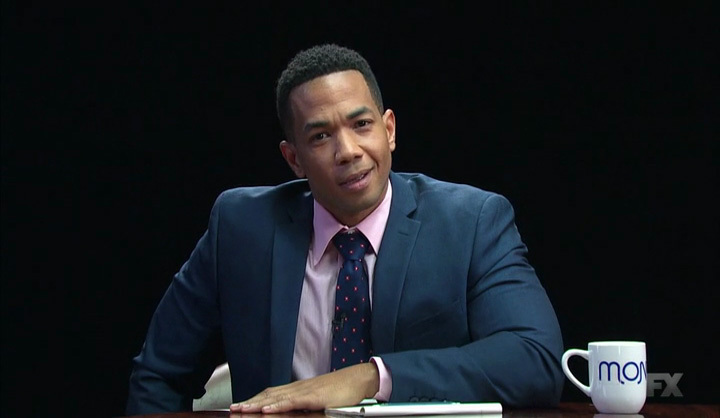 One episode is even based on a fake local talk show, “Montague”, punctuated with equally false ad breaks (1×07, “B.A.N.”), thus disrupting the show’s form and its markers. Both shows follow similar rules and logic, highlighting a possible trend in contemporary TV comedy series stateside (fig. 3-4). Fig. 3-4. Two different settings (here and Fig. 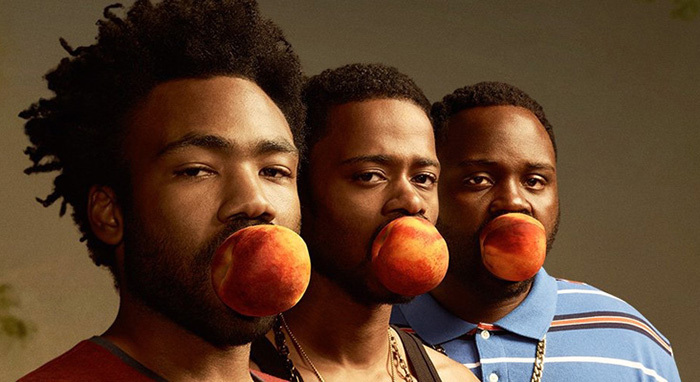 4) for single-issue episodes of Atlanta’s first season (FX, 2016). Fig. 4: A sequel of Atlanta is expected in 2018. Master of None and Atlanta exemplify how contemporary US television comedy has become an important arena for creative and formal experimentation across different platforms (from nonlinear services such as Netflix to cable channels like FX and sometimes even in network programming). It can push back the borders and expand the definition of the genre, on one hand, and respond to the challenges of the complex current media scenario with original narrative structures, comedic devices, and means of engaging a dispersed audience, on the other. Both these shows, and many others, are trying, through trial and error, to mix traditional elements from television comedy’s enduring history with a wide array of innovations, reinvigorating it with other aesthetics, genres, and ways of storytelling. The classic half-hour format is undergoing sweeping changes that are stretching, or at least partially modifying, the notion of a comedy series to include original characters, fresh tones, and new writing and production methods. The forms of most of the TV comedies broadcast or released by television players like Netflix or Amazon, HBO or FX in recent years have seen various changes, in their durations, lengths, rhythms, sequences, shapes, and so on, masked at least partially by the services’ expansion policies and strong marketing. In a circular process, these changes are a reaction to a varied production and distribution scenario while also affecting the nature of the texts and of the entire genre, from writing processes to production models and distribution patterns, and even the complex relationship between comedy narratives and their audiences. Five key trends encapsulate how contemporary US television comedy is being reshaped. They show how the “peak TV” phenomenon – with a glut of high-quality, high-value content – also leads to some loss of richness, or at least to contradictory results. First, season lengths are shrinking. The full season for a contemporary TV sitcom or comedy series may encompass 13, 12, 10, 8, or just 6 episodes, scheduled once a week or released all together according to the various platforms’ needs. The same is happening in other genres, with similar reductions. However, it is more significant in a genre like comedy, where traditionally the most successful titles had (and sometimes still have) up to 27 episodes per season, or at least 24 or 25, allowing a looser narration and a deeper connection with viewers’ everyday lives. Both Master of None and Atlanta, for instance, have ten-episode seasons. Second, with this shrinkage and the current distribution approaches many titles can no longer fill an entire television season. Indeed, in a traditional weekly schedule, the episodes are confined to one portion of the year or are divided into smaller batches with big gaps in between; and when they are released before a weekend, all together or in two parts, their impact evaporates in few weeks, as new shows take over. Moreover, the one-season-per-year rule is increasingly broken, with longer pauses in production and distribution. Master of None’s first season was released on Friday, November 6th 2015; the second, eighteen months later, on Friday, May 12th 2017. Atlanta, broadcast weekly on Tuesday evenings, spanned just two months, from September 6th to November 1st 2016; its second season is due after a two-year hiatus, in Fall 2018. Third, contemporary US comedies often lose, or at least loosen, the connection between television programming and the audiences’ everyday lives, with their shared timings and rituals. While traditional sitcoms fitted snugly into a national and supranational community’s yearly routine of seasons, holidays and other habits, with special episodes at Halloween or Christmas, this long-term timing is disappearing as the episode numbers dwindle and distribution modes focus on small portions of the year or on single-day releases. Binge-watching, or even more intensive linear viewing, allows full immersion in the narrative world (which works especially well for drama series) but inhibits the weaving of the complex fabric of viewing and living times that can make comedy work on a deep level through long-term commitment and frequent repetition. Both Atlanta and Master of None, as stated, work by constructing a sequence of special episodes, but this has nothing to do with classic narrative devices such as civic and religious breaks – and even when it does, as with the Master of None season two Thanksgiving episode, the constant availability diminishes the power of this connection (fig. 5-6). Fig. 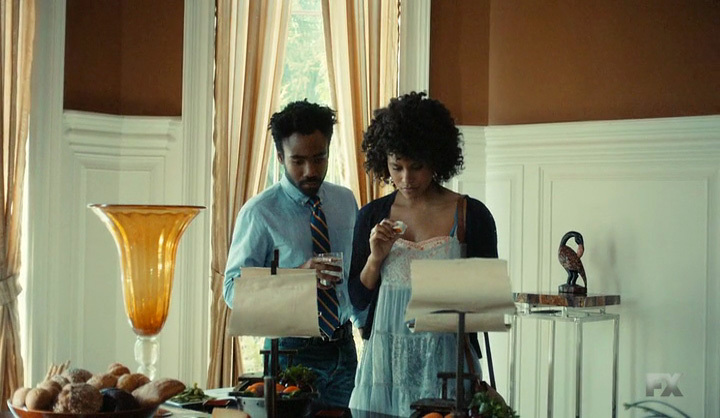 5: In Master of None’s ”Thanksgiving” episode (2×08), the viewer follows a series of Thanksgivings, starting with the time when Dev and Denise were children. Fig. 6: Same occasion but Denise and Dev are now grown-ups. A fourth trend in contemporary US television comedies involves individual episode lengths. As they are no longer forced to fit into the network scheduling slots and advertising breaks, they can expand (sometimes up to 35 or 37 minutes, bridging the gap with dramas), allowing each episode to be shaped around its narrative and comedic needs, with fluctuating durations. The Atlanta episodes vary from 21 minutes (a classic network runtime) to 26, while Master of None has a wide range, usually 26–36 minutes, from a minimum of 21 (2×03, “Religion”) to a peak of 57 (2×09, “Amarsi un po’”, a more-than-double episode). On one hand, writers and showrunners have more freedom. 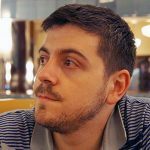 On the other, the limits and constraints to overcome, or to play with, are a fundamental comic device, and it is useful to have rules in order to break them. The strict three-act narrative, following the Western world’s narrative traditions while accommodating several commercial breaks, has been abandoned: comedy works differently, with new constraints and mediations leading to new ways of television storytelling. Lastly, as a more general trend following on from the previous ones, the strong traditional connection between comedy series and the half-hour episode is being loosened. Dramas are adopting the 30-minute format, while some comedies are expanding to fill an hour, thus challenging the genre’s key features and changing the very definition of what “comedy” is. Alongside these trends, formal innovation in contemporary US TV comedies is deeply connected with production and distribution models, with creative and writing processes, with narrative and comedic development. And this is impacting strongly both on the “unstable borders” of the comedy genre – traditionally omnivorous and open to a diverse array of content and influences – and on the close relationship that every comedy narrative is supposed to build and develop with audiences. New distribution formats and different rules and constraints, shorter seasons detached from viewers’ everyday lives, episodes that vary in length or develop their stories to almost a full hour are affecting audience engagement, among other things. Traditionally, television sitcoms engage on two levels. The first, obviously, is laughter: through puns and jokes, slapstick situations and awkward dialogues, and a wide range of comedic devices, viewers must first enjoy comedy by making a proper response to the stimulus – often reinforced by the laugh track from the studio audience at the recording. A major staple of the genre, as Brett Mills implies (2009, p. 5), is a “comic impetus”, where performers try to make viewers laugh in specific parts of the episode. This kind of engagement, however, does not last: it can be built up, one joke after another, but it cannot sustain the horizontal growth needed by long-term television seriality, where each episode is just a portion of a (hopefully) longer run of episodes and seasons. The second level of engagement, then, is affect: the audience’s involvement in the characters’ fictional lives; building domesticity, familiarity and affection as the narrative develops; the sense of appreciation and satisfaction of recognizing new stories in a fixed, stable pattern. David Marc (1997, p. 203) is right: sitcom is a genre of “comic mitigation”, which can reduce comedy’s disruptive power in order to use it longer, somehow normalizing it. Through the classic TV comedy seasons, the first level of engagement with the viewers becomes less important, allowing more room for the second. In general, any sitcom plays on this dualism, where the jokes quickly get the laughs, while the repetition of similar elements across the episodes gradually builds the affect. In this way, laughter can slowly transform into a smile. As a result of all the trends mentioned, the second kind of audience connection is at least partially lost in contemporary television comedies. Shorter series and seasons, less repetition, weaker temporal alignment with viewers, all fundamental devices in this respect, leave a weaker bond between text and audience, loosening one of the most important factors of engagement. A strong connection with the viewers, though, must be built nonetheless, and this explains why more and more recent comedy series now have different narrative structures. There are two contrasting approaches. The first direction brings comedy closer to drama, not only in its form (as with episode length) but also in its narrative features, themes and tone of voice. “Dramedy” is the usual umbrella term for a slew of shows that find their own way of balancing drama and comedy, typically by stressing the dramatic at the expense of the comic. In contemporary US cable and on-demand comedies, then, and sometimes the network ones, too, the jokes, puns, funny situations, and more generally the light-hearted approach typical of classic sitcoms are thinned out or almost even expunged. Unable to achieve affect, these titles avoid laughter, too. The shift towards dramedy, or at least a semi-dramatic narrative, is at once a creative and stylistic choice and a necessity: there is no longer enough time to develop affect and familiarity, and the shows are no longer part of viewers’ everyday routines, so other passions are needed, and drama is quicker than comedy at rousing them. From Love (Netflix, 2016–) to You’re the Worst (FX, 2014–), from Togetherness (HBO, 2015–16) to One Mississippi (Amazon, 2015–), the best way to make the audience still feel something is through drama and melodrama. The goals of some contemporary comedy need no longer include laughter (fig. 7-8). Fig. 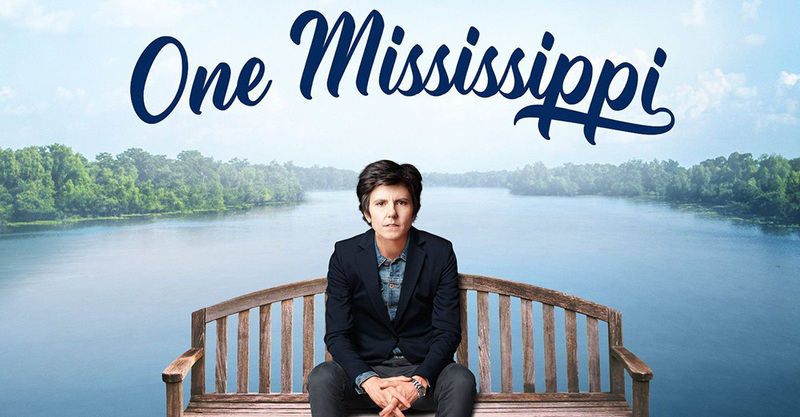 7: Amazon’s One Mississippi: comedy, dramedy, traumedy? Fig. 8: You’re the Worst (FX, 2014-), especially in the last seasons, deals with dramatic topics as depression. The second and at least partly opposing direction in contemporary US TV comedies is a return to the genre’s episodic nature, eliminating the layers of serialization historically inserted in it and favoring narratives with a fixed, stable conclusion in each installment. On cable channels and on-demand platforms, comedies often have no horizontal development, focusing only on the vertical storylines and dealing with triggers, topics and situations exclusive to each episode. After the first few episodes of a new title have established the characters, the structure, the tone and the kind of humor, the subsequent installments are mutually disconnected. Louie (FX, 2010–15), Broad City (Comedy Central, 2014–), Unbreakable Kimmy Schmidt (Netflix, 2015–) and Man Seeking Woman (FXX, 2015–17) all illustrate to some extent this simplification of storylines, with quick conclusions reached at the end of each episode or single subsection, even. Once again, it is both an artistic choice and a “technical” necessity: consumption free from temporal and other constraints, with binge-watching or random always-new choices, leads to a quicker short-term connection with the audience that is better exploited by vertical narratives. Comedies, then, are selecting a single issue for comic treatment or even constructing a series of non sequiturs, prompting rapid laughter and establishing easier, low-degree, low-intensity affect. These trends towards including dramatic and melodramatic elements and verticalizing jokes and narratives are the poles of a continuum on which most contemporary US television comedies are now happening, with a more deliberate choice of dramedy or episodic sketch shows or, more often, a mixed approach. 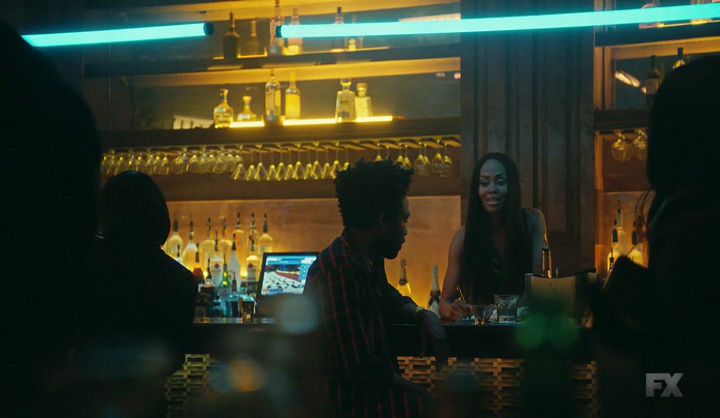 In the first seasons of Master of None and Atlanta, the selection of the single topic to address and the resulting continual change of locations, viewpoints and narrative elements clearly place the shows in the second stream, in which every episode engages the viewers in a different way. Both titles, however, also at least partially embrace the tendency to engage the audience through drama, often downplaying the laughter and taking a more bittersweet approach to characterization and storylines instead. These are necessary changes in an evolving television and media scenario (fig. 9-10). Fig. 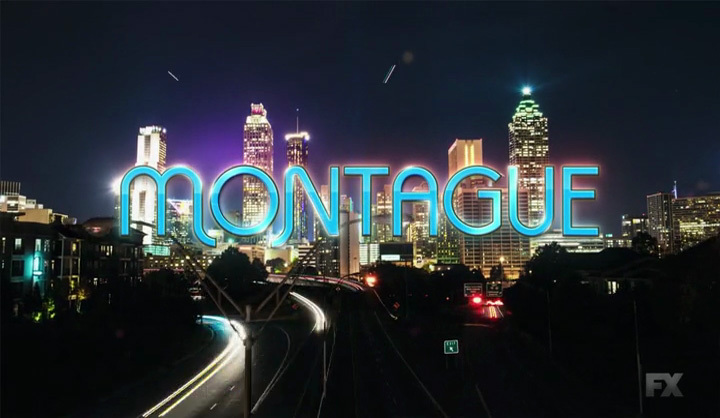 9: In Atlanta’s ”B.A.N.” episode (1×07), the classic nature of a comedy series is broken to include a fictional talk show, ”Montague”. Fig 10: One of the characters, Paper Boi (Brian Tyree Henry), features as a guest on the talk show. Tim: “Hope we’re not keeping things in just because they’re funny”. Beverly and Sean: “In… the comedy”. Tim: “Oh, you two are so old-school. Comedies don’t have to be funny anymore. Some of the biggest comedies aren’t even remotely funny. Audiences don’t need your little jokes and your laughs and your humor anymore. You just have to end after 30 minutes. That’s it, bang, you’re a comedy” (fig. 11-12). Fig. 11: The writing room scene from Episodes, 5×01 (Showtime, 2017). Fig 12: The self-reflexive meta joke pinpoints a major trend in contemporary TV comedy. In a few brief remarks, Episodes, a niche premium cable comedy with a long run and a cult following, thus highlights a major trend in contemporary TV comedy writing and production, confirming its ability to give an insightful perspective on television’s industrial backstage and the consequences of its decisions. This was, of course, a joke. It was fully in line with the series’ awkward situations and quirky humor, with a self-reflexive, meta-textual conflict between different narrative and extra-narrative strands. But it also works well as a commentary on a contemporary scenario where titles like Master of None and Atlanta are winning over critics and viewers alike and where the boundaries of the comedy TV genre, because of distribution, format and audience practices, are becoming increasingly stretched, calling into question even the fundamental defining elements of humor and laughter. Barra Luca (2012), Risate in scatola. Storia, mediazioni e percorsi distributivi della situation comedy americana in Italia, Milan, Vita e Pensiero. Barra Luca (2015), “Unidentified Foreign Objects. The Difficult Path of US Sitcoms into Italian TV Schedules”, in Comunicazioni sociali, 37(1), pp. 22–35. Barra Luca (forthcoming), “Les formes, durées et formats des comédies télévisuelles américaines. Distribution, engagement du public et instabilité des frontières du genre”, in Boni Marta (ed. ), Formes et plateformes de la télévision à l’ère du numérique. Récits, publics et technologies, Rennes, Presses Universitaires de Rennes. Marc David (1996), Demographic Vistas. Television in American Culture, Philadelphia, University of Pennsylvania Press, II ed. Marc David (1997), Comic Visions. Television Comedy and American Culture, Malden, Blackwell, II ed. Mills Brett (2005), Television Sitcom, London, BFI. Mills Brett (2009), The Sitcom, Edinburgh, Edinburgh University Press.